Krupp Florist has been a family owned business since 1955. Our superb quality of flowers, creative designs, value and professional service has become our success. Known for our "can do" attitude, the Krupp team has 7 designers including one FTD Master Designer and one FTD Master Florist Manager to create any style or look you desire. We carry the largest inventory of Equadorian roses in the area with many unique colors. With our fleet of cellular dispatched vehicles, you can be sure that your order will arrive on time and in perfect condition. Try us today and see why we were selected as the #1 florist in the area by the local papers "People's Choice Award" for every year since 1997! Would you like to work with the Krupp Florist team of designers and floral specialists? Click here to fill out our application online today. Turn your wedding day dreams into a reality with flowers from Krupp Florist. Each bride has her own style and we strive to show that in your wedding flowers. From a lavish bridal bouquet to a simple rose corsage, all the details are attended to with the utmost care. No matter how great or simple your needs, we can assist you in planning that will easily fit your budget. To help in planning, we would like to take a moment to learn what your preferences are. Call us at 618-233-8593 for an appointment at your earliest convenience. It's your special day, and with flowers from Krupp Florist, your day truly will be all that you dreamed. 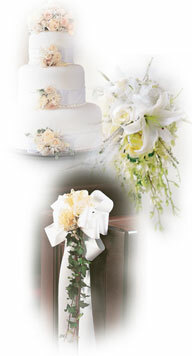 Shown at right are a few ideas for your wedding, including bridal bouquets, ceremony flowers and cake decor.